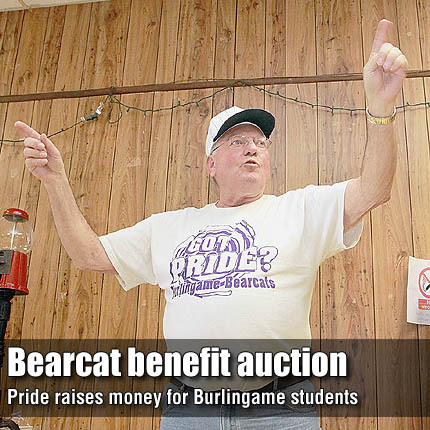 Bearcat Pride, the Burlingame booster club, held a sloppy joe feed and benefit auction Saturday at the Burlingame Lions Club building. Ron Shaffer presided over the auction, which raised $591.50 from donated items, including an antique gumball machine, a football and volleyball signed by senior team members, a treadmill, and various services donated by local businesses. Shaffer stated the money raised, along with about $100 from the sloppy joe feed, would go to the youth of Burlingame.